U.S. President Donald Trump points to Marine One as he departs for Bedminster, New Jersey, from the White House in Washington, U.S., September 29, 2017. Photo by Reuters/Joshua Roberts. Trump fired off a series of angry tweets from his private golf club in New Jersey, taking aim at the mayor of San Juan. 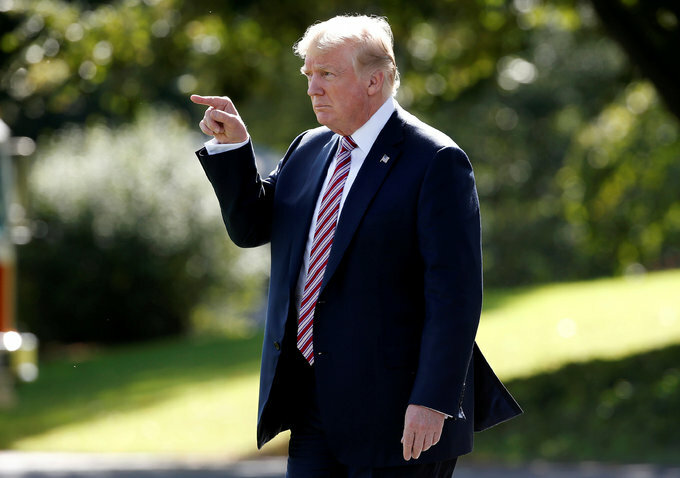 U.S. President Donald Trump on Saturday placed the blame after critics and the mayor of San Juan complained his administration's response to the U.S. territory's plight was insufficient. 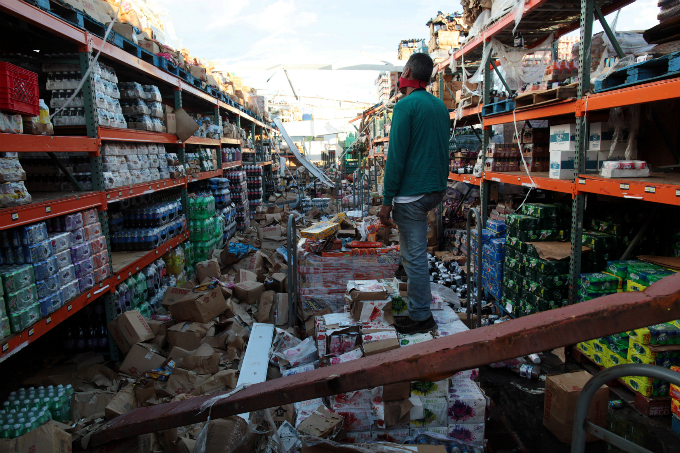 Eleven days after the devastating storm wiped out power, water and communications systems, more than half of the 3.4 million people on the island do not have access to drinking water, and 95 percent remain without power, according to the U.S. Defense Department. "I'm a ticking time bomb on the verge of exploding," said Adeline Vazquez, 53, who needs a ventilator for respiratory problems and whose building in the western city of Mayaguez does not have enough fuel to run a generator 24 hours a day. Maria, the most powerful storm to strike Puerto Rico in nearly 90 years, has destroyed roads, making it difficult to deliver aid and move the heavy equipment needed to fix damaged infrastructure across the island. The hurricane has killed at least 16 people, according to the official death toll. Trump, who plans to visit the island on Tuesday, fired off a series of angry tweets from his private golf club in New Jersey, taking aim at the mayor of San Juan, the island's capital and largest city. On Friday, Carmen Yulin Cruz criticized Trump's administration and begged for more help, a plea that received widespread television coverage in the mainland United States. "Such poor leadership by the Mayor of San Juan and others in Puerto Rico who are not able to get their workers to help," said Trump, a Republican. "They want everything to be done for them when it should be a community effort." Trump - who often turns to Twitter to strike out when his government is under pressure - accused Cruz of being "told by the Democrats that you must be nasty to Trump" and blamed the media for not showing the "amazing job" of responders. Cruz, who has been living in a shelter after her home was destroyed in the hurricane, said municipal employees were working as hard as they could. She also said her complaints had resulted in more food and water being provided. "Actually, I was asking for help - I wasn't saying anything nasty about the president," Cruz said on MSNBC. "I am not going to be distracted by small comments, by politics, by petty issues." The heated rhetoric took the political tensions around the disaster to new heights, but Puerto Rico Governor Ricardo Rossello tried to distance himself from the battle ahead of Trump's visit. In an interview with Reuters on Saturday, Rossello said: "I'm not paying attention to social media," adding "my only focus right now is to make sure the people of Puerto Rico are well." When pressed, Rossello said he did not interpret Trump's tweets as a slight to Puerto Rico's people. "When I read that tweet, it was in reference to the mayor of San Juan, not to the people of Puerto Rico," said Rossello, who has made a point of working cooperatively with Trump's administration on aid for the island. "I saw it as a personal difference with the mayor of San Juan," he said. Rossello and Cruz are members of rival political parties. But Trump's comments drew swift condemnation elsewhere, particularly from U.S. Democrats. "The definition of 'poor leadership' is sitting at your golf club while millions of U.S. citizens beg for your help," U.S. Senator Elizabeth Warren, a Democrat from Massachusetts, said on Twitter. Later in the day, Trump tempered his tweeted barbs. "We must all be united in offering assistance to everyone suffering in Puerto Rico and elsewhere in the wake of this terrible disaster," he said. The U.S. military is moving in more equipment and personnel to help the Federal Emergency Management Agency (FEMA) and state officials respond to the destruction from the storm, which landed just as the island was recovering from Hurricane Irma. 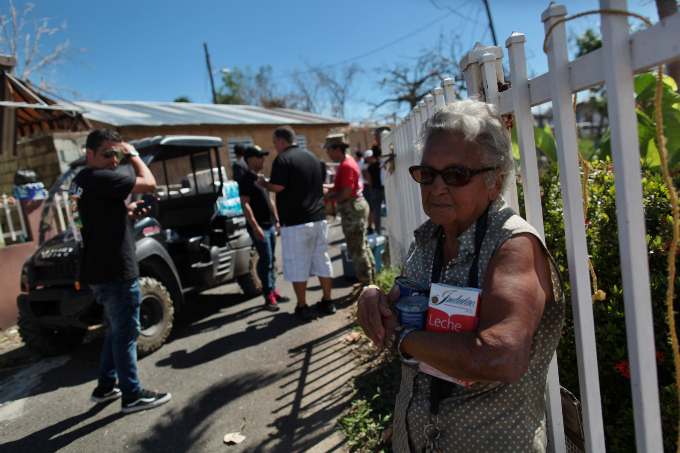 While FEMA has said it has delivered millions of meals and liters of water, many Puerto Ricans have said the aid has been too little and has not made it way to large parts of the island. Many said they are losing patience and wondering why, as American citizens, they are not getting the same relief as residents of Florida and Texas after storms Irma and Harvey. San Juan resident Judith Berkan said power shortages and long lines for cash, food, gasoline and medical attention were wearing people down. "Things don't seem to be getting better," Berkan, a lawyer, said in a text message. Outside of San Juan, there were few signs of federal workers in their localities and mayors outside San Juan have told local media aid was not making its way to them. Mayita Meléndez, mayor of Ponce, home to about 160,000 people on Puerto Rico’s southern coast and about 130 kilometers (80 miles) from San Juan by road, told the El Nuevo Dia newspaper on Saturday that much-needed medicine was not making its way to hospitals in the south. Asked why there were not more workers spread around the island, FEMA Administrator Brock Long grew defensive, saying media needed to "start focusing on the progress that has been made." "Hang on, my mission is way more difficult than trying to get to one area," Long said on CNN, saying the agency had set up hubs around the island, and that Mayor Cruz needed to "get plugged in to what's going on" in the response. Puerto Rico's creaky power grid was wiped out in the storm, a loss expected to further cripple the island's economy, which has long been mired in recession. Members of the board in charge of resolving its debt crisis met Trump administration officials and members of the U.S. Congress this week to ask for more financial assistance for the hurricane-struck island, the panel said on Saturday. The insurance industry has begun to tally the damage from Maria, with one modeling company estimating that claims could reach $85 billion. Amid the economic woes, the island has also seen the largest percentage drop in population of any U.S. state or territory since 2010, which will likely hamper any recovery. The migrants are mostly younger workers, economists have said. The devastation is likely to lead more people to leave, and as the population decreases, so does the tax base, economists said.